Sometimes life converges, crosses, and then spreads, like peaking waves in a choppy sea. Yesterday I went to Oxford. I had been invited to give a seminar about AstroGrid at the Oxford e-Research Centre. This felt weird. The software is in a good state, and will be released in April, but the staff on my project don’t know if they will get paid this month; our expected grant announcement is on hold because of all the STFC problems. That stream of thought continued as I crossed Keble Road to Astrophysics, to meet Roger Davies, who like myself is entangled in all the astro-politics. We asked each other if there was any news of the Select Committee hearings..
Roger had invited me to Dinner (capital D) at Christchuch College. This was extraordinary, in the painfully beautiful but privileged Oxford manner; ancient quadrangle, sonorous bell, flapping gowns, glass of sherry in wood panelled room. Then into the Great Hall to sit at top table next to the Dean, three feet above the massed ranks of Christchurch students, seventeenth century portraits staring down from every wall. “Wow” says I to Roger, “this is so Harry Potter”. “Yes of course” says Roger, “this is where it was filmed…”. My blog, my science, my politics, my children’s fantasy worlds collided in that moment. But then the clock struck nine and I had to leave before missing my train. This entry was posted on Tuesday, January 22nd, 2008 at 6:38 pm and is filed under Academia, Life. You can follow any responses to this entry through the RSS 2.0 feed. You can leave a response, or trackback from your own site. What a lucky chap I am to have two such exciting invites. After the camel, the pie, and the peas you are both welcome up here for haggis neeps and tatties. Or maybe down to Leith for deep fried mars bar and chips. After weeks of heresay we finally have Keith Mason, live on the web, selling astronomy down the river, making no attempt whatsoever to defend the discipline, arguing that Daresbury and ATC were never meant to be as mammoth as they are, ignoring fact wherever possible, and what do we avid readers of the e-astronomer find? Andy wasn’t listening – he was troughing with his posh old mates down at Hogwarts! Personally I would have taken the dinner at Hogwarts over listening to the committee as well. In a similar vein I would suggest playing with the kids rather than summing up tonight. Although this is a very big, brown-coloured mess it should not dominate lives completely. Life is way too short. Do you know how much time I have spent on this rubbish when i could have been playing Halo? Oh, or spending time with my wife of course. 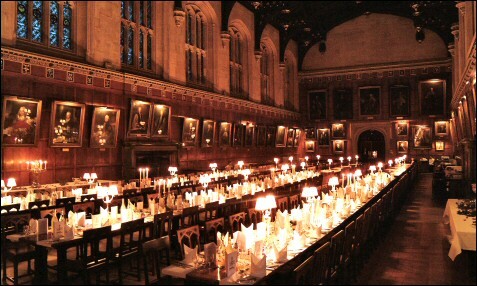 I’ve had the privilege to dine at High Table at CC, and the funniest thing I notices is that the Harry Potter films CGI’d out the dining hall trolleys and hot stand, ubiquitous to every Higher Educational establishment in the UK! P.S. I ken the deep fried Mars Bars from the chippee on Broughton Road, Edinbugh well too!! samego króla. Tym bardziej, że, podczas gdy wywniosk.